For bookings of three or more people we will ask you for a confirmed mailing address of the person making the booking. We will ask each person for a CASH bond of $150(NZ), which is fully refundable on Check-Out should there be no issues, damages to property or excessive cleaning to be carried out. Breach of this policy in any way will mean loss of total bond paid. Our standard cancellation policy applies. Changes to numbers of guest [reductions or increases], cancellations up to 7 days prior to check-in date have no charges. Any changes to the booking within the 7 days up until check-in time will be charged at 100% of the total booking amount due. The credit card used at the time of the booking will be pre-authorised for 100% of the booking 2-weeks prior to the arrival date to confirm the booking. We will contact you if there are any issues with this procedure prior to your arrival providing that the contact details given to us at the time of booking are true and correct. If we are unable to pre-authorise your card, we will not be able to guarantee the booking is confirmed. We require a Security Deposit upon arrival and we prefer to deal with one person in the group who is responsible for the groups conduct in our premises at all times. Any damage etc is to be paid for prior to checkout. 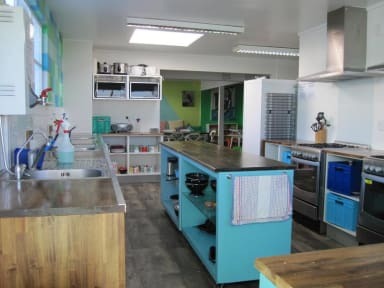 Modern, artistic and creative, ArtHouse Accommodation Boutique Backpackers is located in the Tauranga central city. We are very conveniently situated in the heart of the city. We are a 2 minute walk to the intercity bus stop, 2 minute walk to all of the restaurants, bars, clothes shops and convenient stores. And the beauty of it all is a 2 minute walk to "The Strand", where you can enjoy beautiful scenery while talking a walk along the railway bridge. We are located at 102 Cameron Road, the Tauranga Domain Park is a stone's throw from our front door where you can relax and have a picnic in the sun. We offer quiet, contemporary clean and modern facilities with well-appointed kitchen and bathroom areas. Friendly and knowledgeable staff are more than happy to help you organise some fun whilst you explore our beautiful city. We are an alcohol-free and drug-free hostel. Alcohol and/or drug use will not be tolerated in our hostel as we believe in getting 'high' on life and providing a safe place for travelers to rest, relax and get a good nights' sleep where possible. Please don't be offended if we ask you to leave if you are drunk or under the influence of any other substances. Thanks for respecting our place.